In April, Bond no. 9 will launch the fourth fragrance in the I Love New York series (see prior launches I Love New York for Her, I Love New York for Him and I Love New York for All). The new fragrance, I Love New York for Earth Day, celebrates the Earth Day holiday, to be held this year on April 22, and is described as "fresh, green, metro-sophisticated". Like the environmental movement itself, I LOVE NEW YORK for Earth Day is rich in youthful vivaciousness and hope. And like New York, this lush green tuberose is also sophisticated and assured. Its wakeup opening notes, sprightly tangerine and orange flower water, blended with more tropical orchid, segue into the heart of the scent: a stunning floral composed of intoxicating tuberose, lily of the valley, and orris. Base notes of durable musk, amber, oakmoss, and sandalwood sustain this heady bouquet. Bond no. 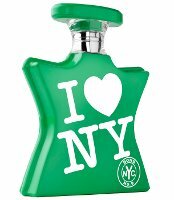 9 I Love New York for Earth Day will be available in 50 ($105) or 100 ($175) ml Eau de Parfum. Ohh, tuberose! Would love to try this one. The only fragrance I like by Bond No.9 has been Chinatown so far, but this one sounds wonderful. It does sound nice, hope it is not TOO fresh. I do love a green tubey, and might give this one a sniff, but I can’t help wondering: is metro-sophisticated like metro-sexual? I was wondering that too…don’t know if it’s code for unisex, or if they’re just trying to say it’s sophisticated. Same here. I did a double-take, between that and the “youthful viciousness” I saw in the blurb. And I went to bed early last night, so it can’t be that I’m tired. Yes, because when I think “green” and “environmental,” New York City is EXACTLY the town I think of!? Ok, before I get hate mail: I KNOW that New Yorkers walk and take transit more than just about anyone, but Central Park is no replacement for an actual greenspace, IMHO! The press release had lots of info about why NYC qualifies (mass transportation, recycling, etc) but it was too long to repeat here. But, that said, bear in mind this is for NY state, not the city. The whole I Love New York series is done under licensing w/ NY’s tourist board, which owns the phrase “I Love New York”. Dense urban living is actually very sustainable, much more sustainable and green than suburban single family homes with huge lawns. Urbanism is a huge passion of mine (one of my other big interests besides perfume). So while New York might not be literally “green,” the denizens of New York more efficiently make use of resources than most other places. I’m not a Bond No. 9 fan generally, but even I might trundle over to Saks for this one… Green tuberose, DO WANT. I just noticed the Harrods Amber and the New York Amber list the exact same composition on their website, but New York is more expensive. Haha, go figure. I definitely dont love New York prices, but i think i do need a Bond in my collection. My last trip to Saks had Wallstreet and New Haarlem grabbing my attention.